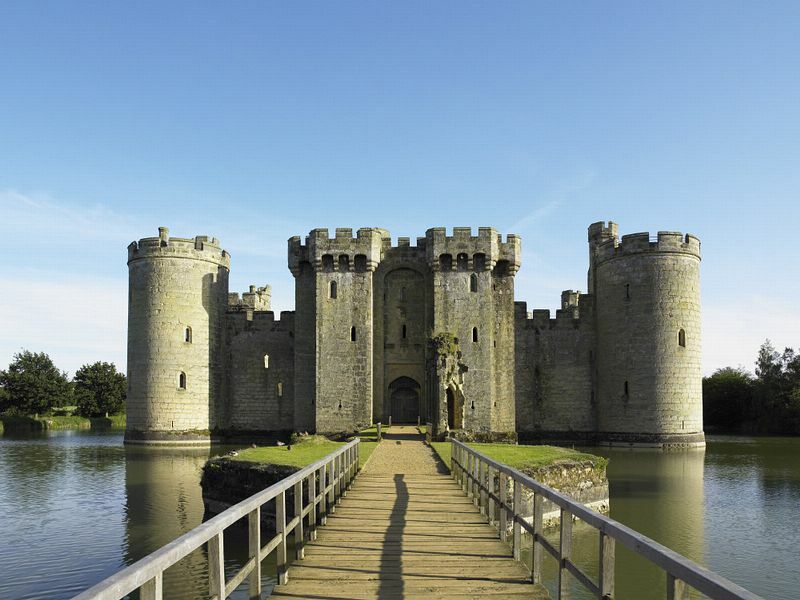 A castle always makes an exciting day out, and Bodiam Castle in East Sussex is no exception. 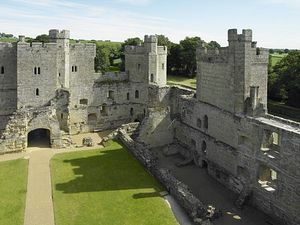 The 14th century exterior is remarkably intact and the interior provides sufficient remaining detail to demonstrate typical castle life with its Great Hall, living quarters and kitchens. Bodiam Castle was built as a defense and home for a Knight, Sir Edward Dalyngrigge, in 1385. He was a veteran of the Wars of France and earned special permission from the king to build this fine home. surviving example, along with the studded wooden door. As you pass through the gatehouse, look up at the vaulted ceiling and see the "murder holes" in it. These were used by the castle's defenders to fire arrows and missiles or pour boiling water and noxious substances on their attackers. 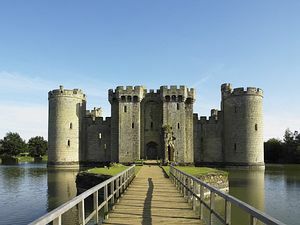 Bodiam Castle was never actually attacked but it was besieged during the War of the Roses and during the Civil War. Unfortunately the interior of the castle was largely dismantled during the 17th century. All that remains of the Screens Passage are three archways. The passage once connected the Great Hall with the kitchen, buttery and pantry, which were often built away from the main house for fire safety. The stone curtain-walls rise from the defensive moat and are topped with battlements. 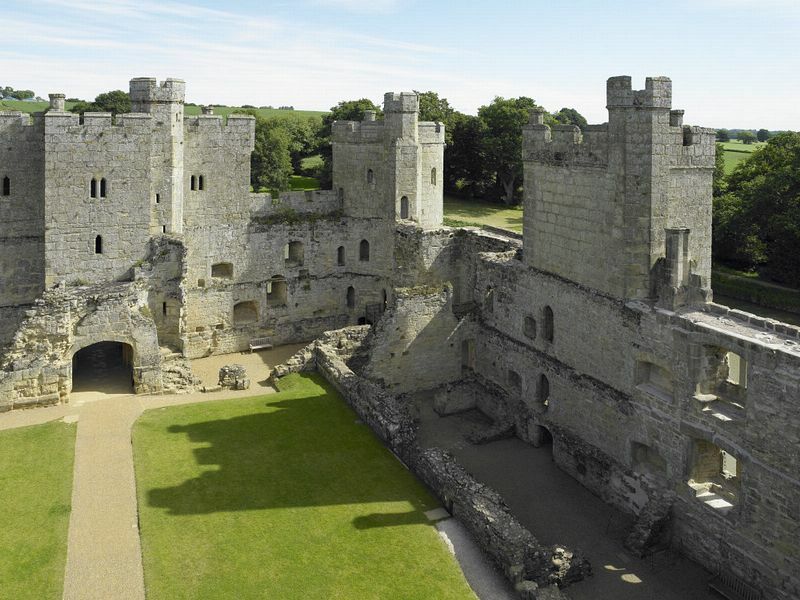 The inner courtyard is still used from time to time for National Trust organized events such as the Grand Medieval Weekend and occasional open air theatre productions. for walking and enjoying the wildlife. In 1829 the castle changed hands and John Fuller of Brightling bought it for £3,000. It was later purchased by George Cubitt, also known as Lord Ashcombe. Both owners worked on restoring the castle. The most recent owner was Lord Curzon, an influential figure in the history and conservation of England. He bought it in 1917 and as part of his extensive works he had the moat drained. It revealed the footings of an original wooden bridge along with pieces of armour, cannonballs and other miscellaneous objects. These are now on display in the Bodiam Castle Museum. 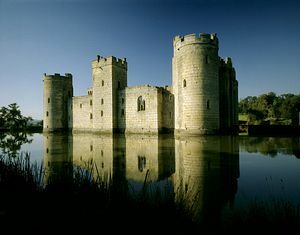 Upon his death in 1926, Lord Curzon bequeathed Bodiam Castle to the National Trust. He also left a wonderfully detailed book which was published with many facts about the history of the castle. Visitors today can enjoy the touring the impressive castle building, the ornamental water gardens, millpond and a Second World War Pillbox constructed in the 20th century for more modern warfare. To complete your visit there is a National Trust shop selling Bodiam wine and local honey, amongst other items. There is also a tea room and an ice-cream kiosk. Entrance to castle 400 yards from car park. On the Sussex Border Path.